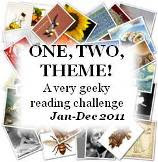 J. Kaye from J.Kaye's Book Blog is taking over several challenges that were hosted by Joy in 2008. I for one am very thankful that this is the case - Joy hosted so many cool ones and it would be very sad to lose them! So thanks to Joy for hosting them till now and thanks to J.Kaye for hosting them in 2009! I'm not doing final lists in 2009, only long lists of possibilities that I may or may not add to as the year progresses. :-) I'd like to read more mystery/crime series and need recommendations - any out there? Well, some of the series are short series... and they're all books that have been on my list forever anyway!